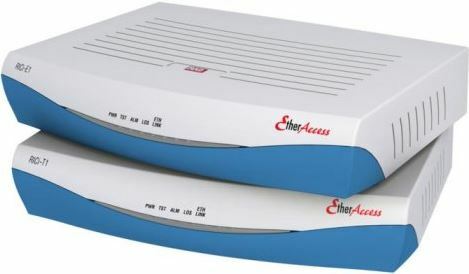 The RAD RICi-E1, RICi-T1, RICi-E3 and RICi-T3 NTUs connect Fast Ethernet over framed or unframed E1/T1 or E3/T3 circuits. The devices are deployed in point-to-point or hub-and-spoke topologies, working opposite RAD RICi-16, Egate-20, Egate-100, and Egate-2000 Ethernet over TDM gateways. This enables carriers and service providers to extend their customer reach and utilize legacy PDH infrastructure in delivering new Ethernet services. Typical applications include Ethernet access, backhauling network management traffic and connecting interoffice or enterprise LAN segments.